We’re bringing ’em back! 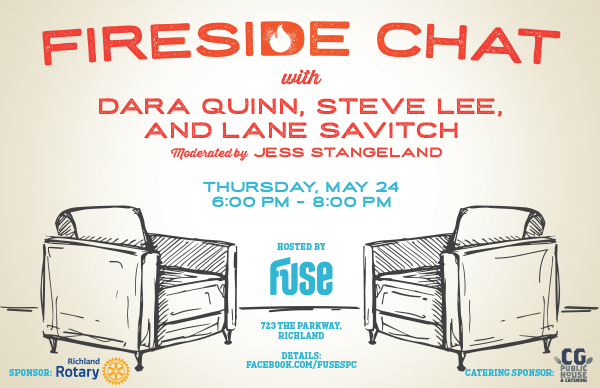 The first 3 interviewees are coming to a stage near you for the first Fireside Chat in the new Fuse! Same format, but triple the fun. Join the Fuse Community Development Committee for a panel discussion with Dara Quinn (Emerald of Siam), Lane Savitch (Kadlec COO), and Steve Lee (Owner Green2Go, Kennewick City Councilman) moderated by our own Fuse Manager Jess Stangeland. Get your tickets NOW before they sell out! HUGE thanks to our sponsors: Richland Rotary, CG Public House, and Paragon Corporate Housing. Drinks and light hors d’oeuvres included!